For the month of September, I am sharing couples that we have become acquainted with that share a disability in their marriages just like Jimmy and I do. We have been so blessed that the Lord has allowed our lives to cross with these other couples. They have challenged us, loved us, encouraged us, and have shared their lives openly with us as we have tried to do with them. The first couple I must share with you have had the mot profound impact on my life. As they have been in this “disabled marriage” commitment for a very long time, they have my deepest respect and have earned my attention. You all probably already know them by name as their influence in America and around the world has been monumental in the disability community. 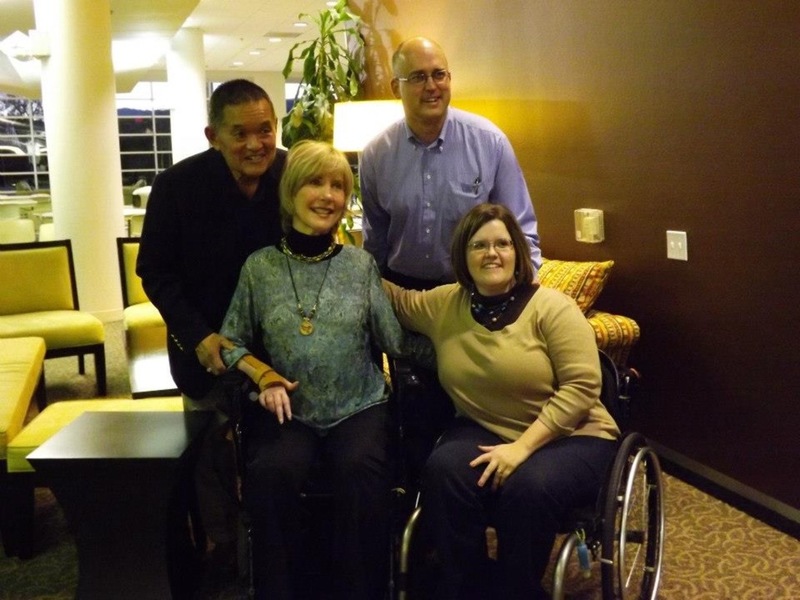 What Christopher and Dana Reeve are to the spinal cord world, Ken and Joni Eareckson Tada are to the Christian disability community. Joni broke her neck as a 17 year old girl in a diving accident and she has been a quadriplegic for over 40 years. She and Ken married after she was already in a wheelchair. That already makes him a hero to me. Not that he had pity on a poor girl in chair and decided to marry her. Quite the contrary! He didn’t notice the chair, but fell in love with the girl. Sigh. I have read their books and watched her movie. I have heard her speak. But It is not these things that attracts me to this couple. It is watching them together. You can see the love and devotion they have for one another. Marriage for those of us with disabilities is hard. To see that love and devotion after that many years of hard marriage is so refreshing and gives hope that if they can do it, we can too. You can read a new book from them about their marriage called Joni and Ken: An Untold Love Story. It is a great read. Jimmy and I have had the privilege of meeting and talking to Ken and Joni a couple different times now and they are by far, one of my all time favorite disabled couples. I think most of my disabled friends would agree with me. Thank you Joni for you beautiful attitude through adversity and your Christ-like love for those of us who are disabled. Thank you Ken for your devotion to The Lord and your wife to love as Christ does. Keep it up you two. You are paving the road for those who are following you in our own marriages. « We Didn’t Get Healed…or Did We?